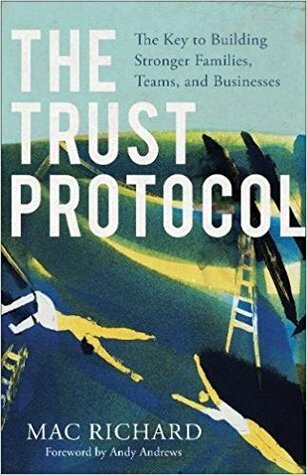 The Trust Protocol: The Key to Building Stronger Families, Teams, and Businesses by Mac Richard was published on November 7th 2017 by Baker Books. Synopsis: In our hyper-connected age, we follow, like, and favorite our way through family, school, work, church, and friendship while rarely, if ever, experiencing real connection or creating real impact in the lives of real people. We react rather than reach out. We react rather than reach out. We hunger for the very thing we are inadvertently starving–actual connection with others–because we never allow ourselves to risk the very thing we crave: Trust. Through powerful true stories and biblical insight, Pastor Mac Richard shows readers how to create a culture of real community, trust, and productivity, starting at home and radiating out through all of their relationships. He challenges us to embrace our calling as our brother’s keeper, choosing connection over comfort and accountability over acceptance. This book is for anyone who wants to build stronger families, teams, and businesses. About the author: Mac Richard is the founding pastor of Lake Hills Church in Austin, Texas. He and his wife, Julie, launched Lake Hills with a passion to redefine church for the city of Austin and beyond. Mac and Julie have two college-age kids, love any time they get to see them, and are thoroughly enjoying the empty nest years.